Hurricane Katrina, a category 4 hurricane, made landfall on August 29, 2005. It had a storm surge 80 miles wide and 30 feet high. It had winds of over 150 miles per hour and over 100 mile per hour winds over 200 miles inland. 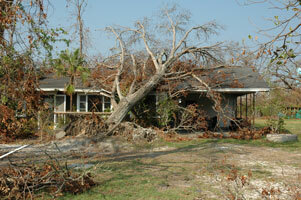 In Tupelo, which is over 300 miles from the Coast, wind gusts of 70 miles per hour were recorded. Katrina did not care if you were poor, wealthy or in the middle. She was an equal opportunity destroyer. Beside the most important species inhabiting our state – the human species – Katrina had other victims. They are the diverse species of fish, wildlife and plants that inhabit this region, including over 170 species of amphibians and reptiles alone. Pine and hardwood forests are their main habitat and the greatest non-human victim. Katrina caused the largest single devastation of forests in our Nation's history. And it is the largest single devastation of fish and wildlife habitat since the Exxon Valdez. 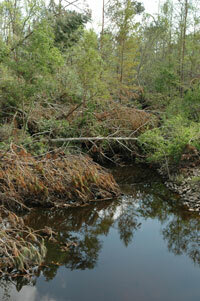 Significant damage has occurred to the forests of Mississippi as a result of Hurricane Katrina. These forests were valuable at producing oxygen, sequestering carbon dioxide, filtering air and water, providing fish and wildlife habitat, including that for many threatened and endangered species, improving the aesthetic beauty of the Gulf Coast and providing opportunities for recreation and solitude, just to name a few. Their contribution to the latter was a major reason the Coast was such a tourist destination. According to the USDA Forest Service, Hurricane Katrina damaged up to 5 million acres, with 4 million acres in Mississippi alone, and most of it on private forest lands. This represents 19 billion board feet of timber with a value of $5 billion. This is enough timber to build 800,000 homes and make 25 million tons of paper and paperboard. According to the Mississippi Forestry Commission, 181 cities and communities have approximately 2.75 million trees damaged or destroyed with an economic value of $1.1 billion. Aerial reconnaissance was done on 48 communities. Hattiesburg was used as a model from data compiled from the recently completed benefit/cost analysis of urban forestry practices in small to mid sized cities in the Lower South to assess monetary damages. The greatest impact was to the 11 Mississippi Gulf Coast cities where economic impact to the urban and community forest is estimated to be $439,099,860.54 with the next greatest impact being, $250,042,696.32, which included 30 communities located near the coastal area from Waynesboro to Brookhaven and south to the coast. The total state impact is estimated to be $1,115,276,478.64. These monetary figures are based on an estimate of trees destroyed (465,009), trees that need to be removed (680,909) and trees that need repair work (1,598,715). Removal and repair work are necessary to the maintenance of infrastructure services, the protection of power deliver systems and the protection of public safety. In order to assist in the restoration of the quality of life on the Gulf Coast, assistance is needed to plan and re-establish trees and forests. As you review this web site’s information you will note that emphasis should be placed on trees that are the most resistant to high winds (i.e., live oaks, longleaf pine and baldcypress).